This is the fifth book in the series, but my first foray into the world of the Sisters Grimm. At first I found it interesting. Two young girls, Sabrina and Daphne, are the last in a long line of descendants or Wilhelm Grimm. They live with their Granny Relda, Uncle Jake, Mr. Canis and Puck, a mischievous fairy with a penchant for trouble. Their parents are asleep, victims of some sort of sleeping spell. The girls are being trained to be detectives and help the Ever Afters, immortal folk from the fairy tales, who are trapped in Ferryport Landing. I like the premise. I like the characters and the story. But as I got into the story I found myself pulling out my iPod every chance I could get to listen. I even found myself lying in bed, listening to the story when I should have been sleeping. This time, the group must pay the evil Mayor Heart and Sheriff Nottingham exorbitant back taxes or risk losing their home. At the same time, three of their Ever After friends have lost valuable magical items and need the Grimm’s help in recovering them. The ending is not what I expected. Well, not exactly. Nor were several of the twists thrown in to distract the family and keep them from solving the case. But they all fit very nicely and the ending was satisfactory – sort of. The story ended with a “To be continued” as the overarching story continues. I’ve already purchased book six to begin as soon as I finish this review. On a scale of one to ten, I give this book an enthusiastic nine. Read it. 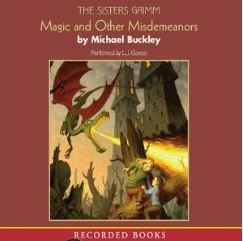 Give it to your daughters, nieces, nephews and anyone who loves fantasy and fairy tales. It’s a delightful book.